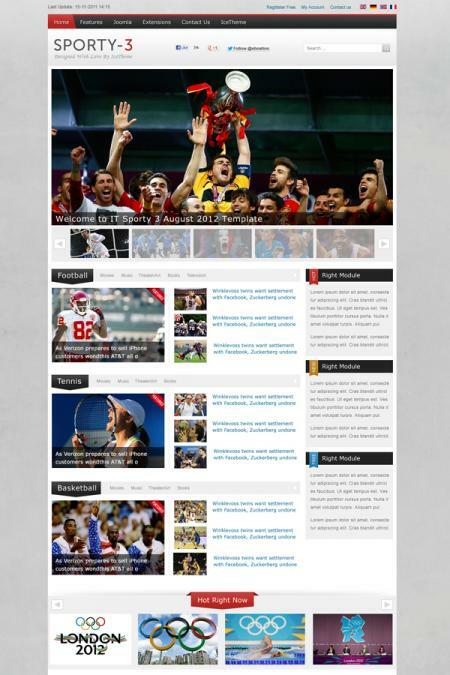 IT Sporty 3 - regular news topics flexible template for Joomla 2.5 developers IceTheme. Design template contains 6 color variations to ensure the best choice appearance when designing a website of any subject and complexity. To increase the functional template developers have been enhanced basic popular extensions studio: IceNewsBlock, IceSlideShow, IceAccordion, IceCarousel and IceScrooller, which will effectively display all the information on the site. The integrated commenting system Disqus comments, site users will be able to quickly and easily add comments to articles and materials. Template perfectly optimized to support mobile and tablet devices, as well as works correctly in all browsers.